Release of hydraulic and lubricating fluids, which impacted soil and process water circulation ponds associated with crushing and conveyance operations. Release of paints, solvents, lubricating and hydraulic oils in a storage shed fire, which impacted soil and process surface water circulation ponds adjacent to the maintenance operations. Release of diesel fuel, which impacted soil surrounding the facility’s maintenance operations and into the primary quarry pit area. Pinnacle initially provided emergency response services. 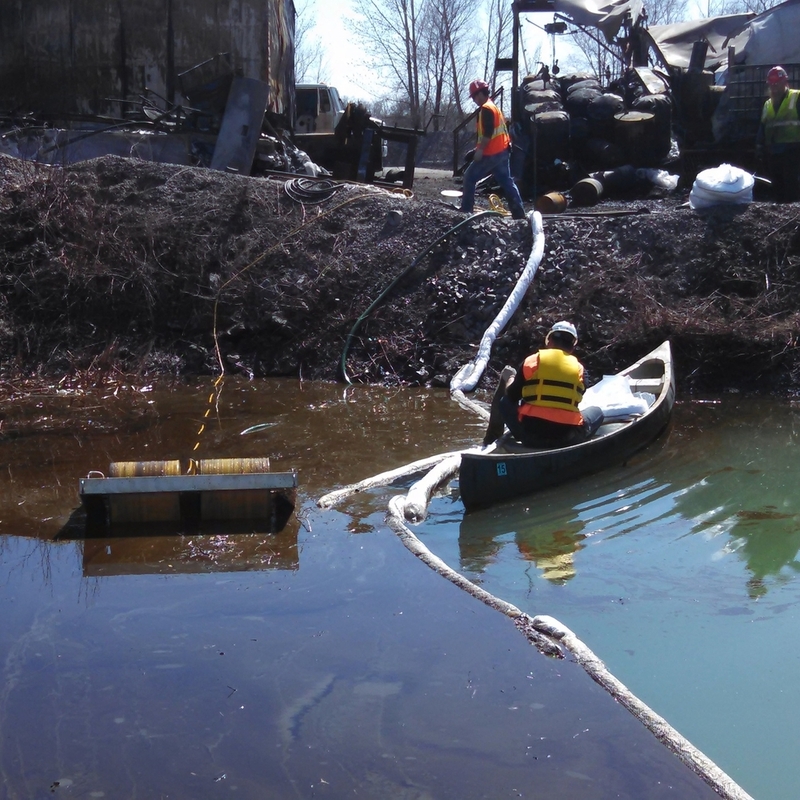 These included recovering pooled oils and diesel fuel on the ground and surface water ponds using adsorbents and vacuum truck systems, and design and installation of an underflow dike system within the primary surface water drainage for impacted areas of the facility. Pinnacle then completed soil investigations, using hand augers, excavator test pits and geoprobe soil borings, to delineate the various impacted areas of soil and develop soil management strategies and disposal profiles. Pinnacle supervised and documented the excavation of impacted soils associated with the crushing system lubricating oils and secured approval of regulatory authorities to rework impacted material into crushing operations. Soils, fire debris and absorbents impacted by the storage building fire were evaluated and profiled for disposal at an approved landfill. Soils impacted by diesel fuel were excavated, screened and transported to a neighboring asphalt facility for blending into hot-mix asphalt; Pinnacle secured an air permit exemption for the asphalt operation to process the soils. Pinnacle also worked with the regulatory authority to qualify the client to receive reimbursement from the state petroleum fund for efforts associated with the diesel fuel release area. Finally, Pinnacle utilized bioaugmentation to address residual impacted soil beneath inaccessible areas, near the process surface water circulation pond rim, and in areas of diesel impact down the slope of the quarry pit edge. Pinnacle performed several sampling rounds during non-operation timeframes to verify degradation of soil impacts, and received final approval to close the site from the regulatory authority.